The Kubu Queen is found on the Okavango River where it maneuvers along for approximately 150km in an area between the Mohembo border and Sepopa. This area is surrounded by untouched waters, lavish islands and dense papyrus swamps. This area is unreachable for most animals and therefore isn’t renowned for the game viewing. Crocodile, hippo, elephant and the rare sitatunga antelope are the only large animals that occupy the papyrus swamp and small mammals like genets, monkeys, cane rats and bushbuck can be found on the secluded islands. The Kubu Queen focuses on fishing and birding as activities offered on board. The summer months (Sept, Oct, Nov, and Dec) are peak tiger fishing season and a natural occurrence known as the Barbel Run also befalls at this time. 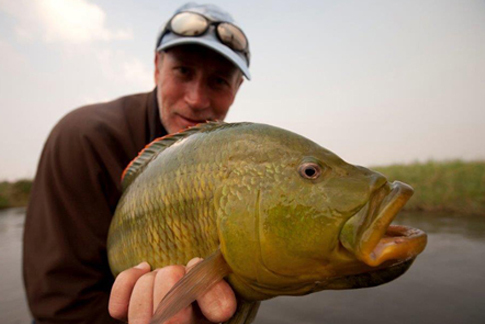 This marvelous time of year allows for the best Tiger Fishing and the Kubu Queen is often booked well in advance for these summer months. There is a bar and dining area on board the Kubu Queen and for those who enjoy a little reading time, there is a small collection of books available on board. 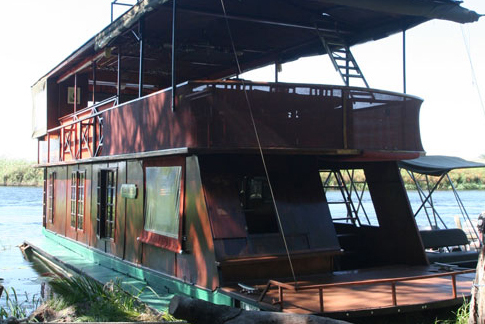 The Kubu Queen has 2 bedded cabins downstairs as well and 2 single sleepers upstairs in an outside open air bedroom. There is a separate toilet as well as an individual shower. For bigger groups up to 12 guests, there are 2 couches upstairs which can be converted into sleepers as well as a small mobile camp on board which can be set up on islands where the houseboat moors in the evening.